WASHINGTON (CN) – Criminal justice reformers and advocates gathered at the White House Wednesday and discussed the future of the movement with hope, despite the “elephant in the room” of the anxiety surrounding the transition to a new president. While reform advocates remain unsure of what the future will look like under President-elect Donald Trump, those gathered in the Eisenhower Executive Office Building Wednesday were thankful for the Obama administration’s role in bringing new voice to their movement, and they insisted that their momentum will not depend on the next president’s support. “I think that our government will only be as strong as we make it, and that applies not just at the federal level but at the state and local,” Obama senior advisor Valerie Jarrett told the gathered advocates. 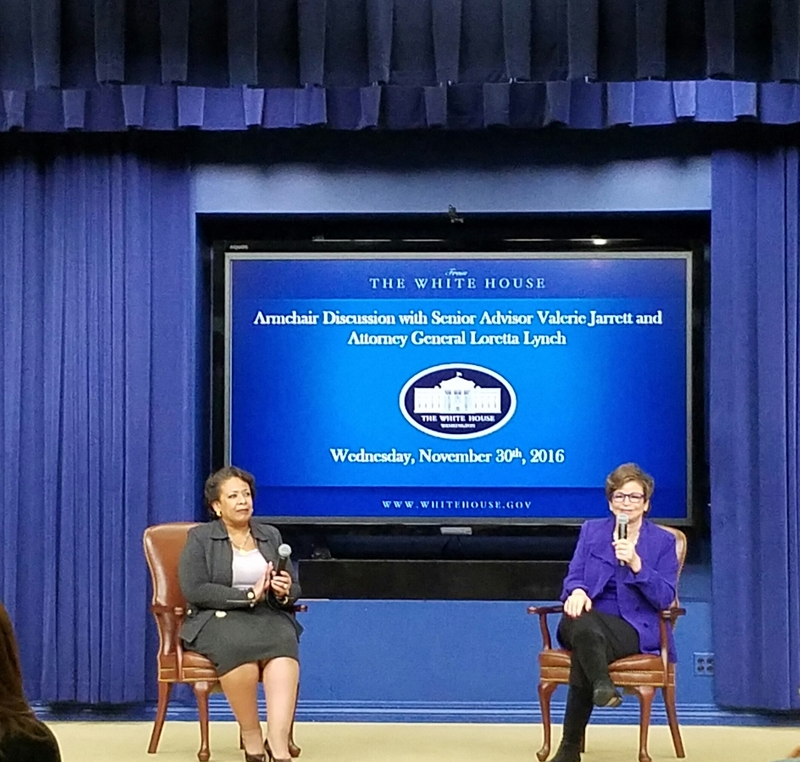 Trump was not mentioned by name during an “armchair discussion” between Jarrett and Attorney General Loretta Lynch, but his tough-on-crime campaign and its potential to erase Obama-era reforms hung over the gathering, which is likely the last of its type to be held during Obama’s time in office. Criminal justice reform has gained fairly broad bipartisan support during the Obama administration, especially on issues such as sentencing reform and changes to prison programming meant to reduce the likelihood of people landing back in prison after being released. At Wednesday’s meeting, Lynch praised her department’s newly announced efforts to set up a “school district” in the Federal Bureau of Prisons to create education programs designed to reduce recidivism and make prisons safer. She also touted the department’s move away from for-profit prisons. Lynch insisted these reforms would last no matter who is living in the White House. But she cautioned that sometimes reformers and future administrations will not agree. In these cases, Lynch was confident the experiences those in the criminal justice movement have gained over the last eight years will leave them capable of continuing their efforts even with a president less sympathetic to the cause than Obama. Miami-Dade County Commissioner Sally Heyman could be one of those people getting work done away from Washington. In an interview, Heyman said her county’s efforts to reform local prison and court bond policies — as well as how police deal with people with mental health issues and punishments for minor, petty crimes — were all key to cutting the county’s prison population by roughly a third. This drop saved the county money, which it was then able to reinvest in other areas, Heyman said. “The big promise is if I make you more efficient, if I save you money, you’ll reinvest it,” Heyman said. The Obama administration’s willingness to allow the county flexibility in such initiatives was critical to her efforts, Heyman acknowledged, and she is unsure that same willingness will continue under Trump. “I don’t know that the passion or the sentiment will be with the next administration,” Heyman said. This fear is common among those who favor reform. The Obama administration has been vocally supportive of the movement, bringing years of quiet, low-level work into the national spotlight. Because Obama amplified a movement that had been building for 15 or 20 years before he took office, Anderson is confident it will survive beyond his presidency. “From my perspective, regardless of who is in the White House, this will continue to be a movement that marches forward,” Anderson said.